Friends! I am in the best mood today because the sun is out. It has been so rainy here recently that I told my mum a couple days ago I wasn’t sure I really lived in The Bahamas. I know bringing up the weather is the cliché thing to do when there’s nothing to talk about, but it continues to be a genuinely interesting subject of conversation. It’s freaky! The cold, the grey, the rain – I honestly have been going through pictures from sunny days to keep myself cheery. Look at all the light and colour in this saltfish! It’s just what we need. 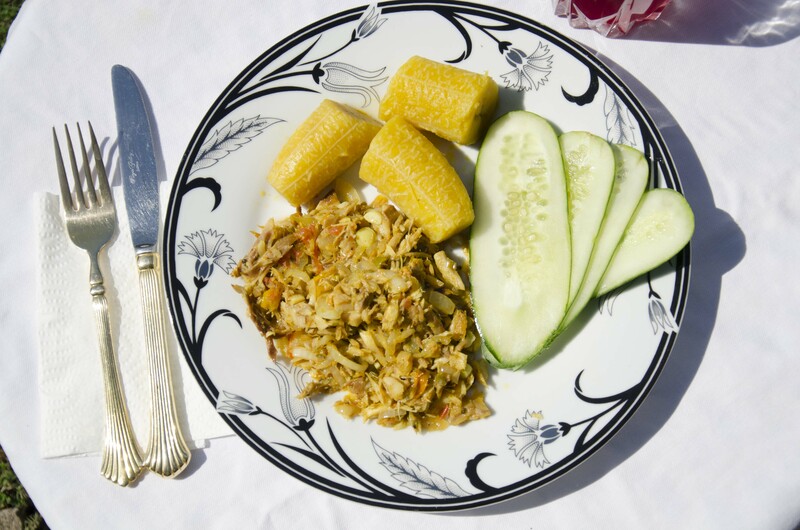 Saltfish (with ackee) is the national dish of Jamaica. It only needs a few ingredients, and as these things often are, the sum is greater than its parts. The only things you really need are salted cod, onions, garlic and pepper. Brother Tom (aka my dad) makes a delicious saltfish, and I talked to him about his method so that I could share it with you. First, you need actual salted cod. Starting with fresh fish and adding salt later won’t give you the same flavour. However the cod is – duh – super salty! So you need to boil or soak it before cooking with the other ingredients in order to make it palatable. My dad boils his; he finds this the easiest and fastest method, plus it flakes more easily afterward, and flakiness is part of this dish’s charm. There are a couple ways you can approach the boiling process. You need to peel the skin off of the fish, either before or after: before is a lot easier. And you need to check for saltiness as things go. My Aunt Claudette pours off her water soon after it starts boiling, but my dad waits until it changes colour, indicating that salt has leached out of the fish. Then he pours off the water and tastes the cod. If the salt levels are right, he’ll move to the next step, but if not he’ll add fresh water and put it back to boil. While the cod is boiling you can prep your other ingredients, and begin to sauté them. Once the fish is ready you add it to the pan and cook everything until the flavours come together. In addition to the veggies I mentioned earlier, people add things like tomato, scallion and thyme. My sister Annaleise doesn’t like tomato, so my dad doesn’t use it. Also, it leaks water when it sits, and that’s not pleasant. Brother Tom doesn’t like thyme, so he leaves that out too. He’ll add scallion if he remembers, but as you’ll see from the recipe, garlic is non-negotiable. There’s tons of it in his version, because we like it a lot! I didn’t actually realise he used that much, because it doesn’t taste garlicky to me. 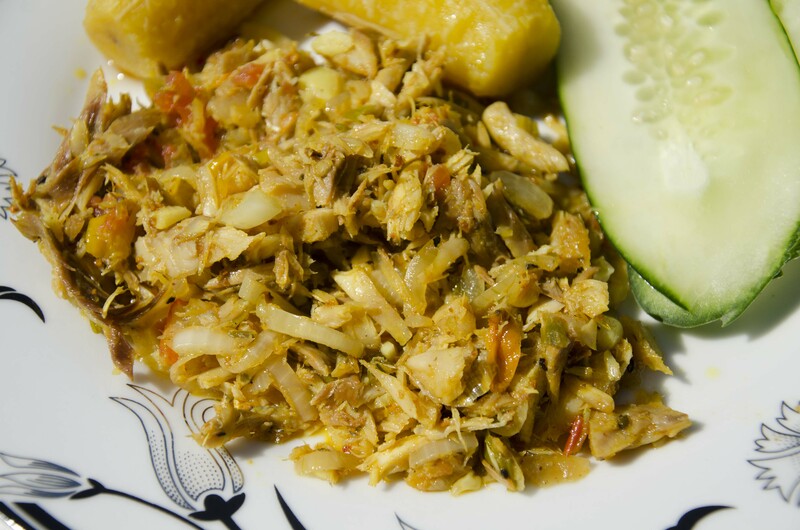 When I think of his saltfish I think spicy, flaky and of course, a little salty! It’s a really lively dish, which is why it pairs well with the simple starchiness of fried dumplings, or boiled green banana, or as pictured here, boiled plantain. 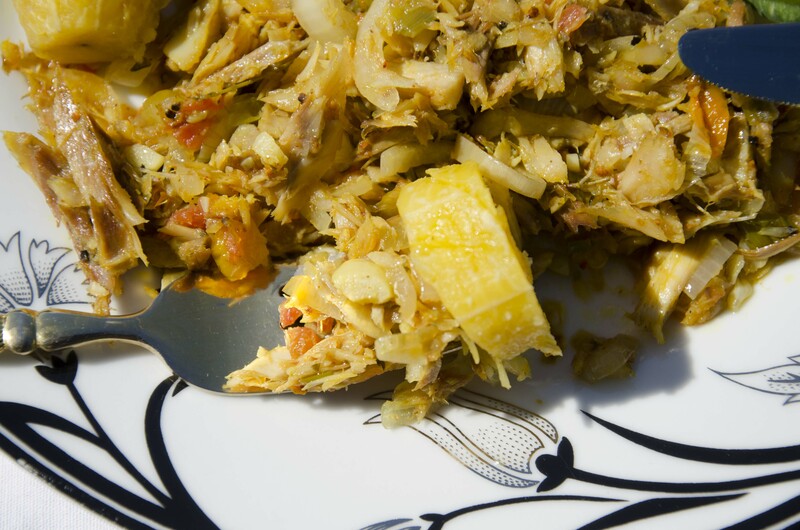 Saltfish is everywhere in Jamaica, but basically nowhere in The Bahamas. I really only ever have it when I’m with my dad – even when we’re in the States he goes looking for salted cod – so for me saltfish isn’t just associated with a place, but a person. Other things that make me think of Brother Tom are Westerns, wildly terrible instrumental music (all genres) and people who go through their workdays drinking only coffee. So you know, dad stuff. I’m blessed to have two of them, and I have to say there is some overlap – like any time I’m using my phone while driving. (For calls! And to change the song! But texting is a no. Or an only-if-I’m-stuck-in-traffic/at-a-red-light.) I try guys, really I do. Use your fingers to strip the skin off of the cod. Place the fish in a saucepan and cover it with about 3 inches of water. Set on the stove to boil. While the cod is boiling, prepare your veggies. Dice the onions, garlic and pepper. After 20 minutes, check the colour of the water in the pot of cod. If it's cloudy, turn off the stove, throw off the water and taste the fish for saltiness. If the flavour is right, you're ready to move on to the next step. If it's still too salty add a fresh covering of water and return it to the stove to boil some more. Once your fish is ready, heat the oil in a large sauté pan. When shimmering, add the onions, garlic, pepper and turmeric. Cook until the onion and garlic begin to soften. Add the cod to the pan and cook for 5 minutes, stirring occasionally. Serve with boiled green bananas, plantain or dumplings. - You won't be adding salt to the recipe besides what's already in the fish. Keep that in mind when testing your cod for flavour. - This recipe makes enough for our family of 5, and we typically have some leftover. This looks so good! I wonder: can you find salted cod in New Providence? I’ve never seen it but my dad says I just need to ask the Jamaicans where they buy theirs! I have a (social) uncle who’s Jamaican and he makes saltfish semi-regularly, so he could get it here, although if he told me he brought it in I wouldn’t be surprised? Idk haha.